Open, general discussion of silent films, personalities and history. As many of you here are aware, for the past 5 to 6 years, it has been my on-going quest — my mission in life — to find young Miss Gladys Egan, a long-lost child actress from the silent film era. She worked under the direction of DW Griffith at the Biograph Company during its "Pioneer Days" from 1908-1914. Suddenly, she (and another child actress of that era whom she worked with, Adele deGarde) seemed to have disappeared from the face of the Earth. It has been my "passion" to find Gladys and, therefore, one of my founding reasons for starting my own website, Larry's 66 Diner, four years ago! Well, the mystery has finally been solved! OUR BELOVED GLADYS EGAN HAS BEEN FOUND ! ! ! ! ! ! 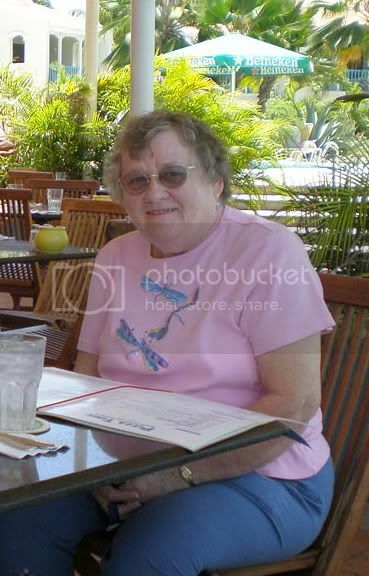 The lady you are looking for is listed as Gladys Beal in the obituaries. I googled her because I did not find anyone listed in the indexes or Ancestry.com matching your dates. That's when I discovered she was a child star of the silent film era! Thanks for the interesting question. I have attached a copy of her obituary. The next step in my agenda is to try contacting her daughter, Mrs Sally Maxwell. Congratulations Larry on your discovery! I know the feeling and there is nothing else like it. spadeneal wrote: Congratulations Larry on your discovery! I know the feeling and there is nothing else like it. Yes, good legwork! Congrats. I agree with Spadeneal, great feeling, isn't it? Jordan Peele, when asked what genre we should put his movies in. I've telephoned the Rochester General Hospital, where she was employed and they would not give me any information — just as I expected, as far as employment records are concerned. I've called the Grace Brethren Church, but it was obviously at a time when a live person was unavailable; also, the voice mailbox was full, so I was unable to leave a message. Upon correcting the spelling of her name, she informed me that Gladys Beale was admitted to the nursing facility on DEC 4, 1995 and remained there until her death on AUG 3, 1997. She further informed me that Gladys' previous address was at a Pinewood Village Apartment Complex in Parkersburg and even provided me with an apartment number. When I questioned her if the Admission Records included any "next of kin" information (hoping to find Sally Maxwell listed), she said there was nothing like that listed. Although there was nothing listed for Sally Maxwell, she located an "S Maxwell" in the telephone directory for me at an address not far from Pinewood Village Apartments. This could indicate to me that Sally(?) chose a location of a nursing facility not far from her own, in which she could easily help look after her mother (assuming this is the correct individual). I also telephone Leavitt Funeral Home. The person I spoke to there said she would do some looking around in the files for me, and return my phone call later today. Well, I received a phone call from Leavitt Funeral Home later this afternoon and the very helpful lady assisting me said that Gladys E Beal (again, with no "e" at the end of her last name :-[) was buried (although the obituary said cremated) at White Haven Memorial Park in Pittsford, NY on AUG 16, 1997. This location, of course, is in very close proximity to Rochester and Newark, where work and family would have been throughout most of her life. She also said that, before she returned my phone call, she had tried contacting Sally Maxwell at the last known telephone number she had for her, but it was disconnected. When I contacted the burial park, I was told that she is in Section "L"; Lot 13; Unit C; Grave #2. Also, buried in the same area are her husband, Verne; and parents, Richard and Gertrude Engle. Miller Funeral Home conducted the interment for her husband, Verne, in 1974. 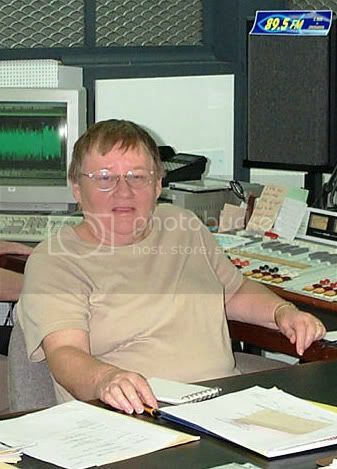 I just received some information from one of my members (Brian) at Larry's 66 Diner, who lives in the UK. He has also been assisting in the quest for Gladys Egan. Does anyone know this lady? I don't know if I'm seeing it just because I want to see it, but she sure does seem to have Gladys' features about her face. Well, this morning I had contact with Sally Zavitz, but I'm afraid the news is quite disturbing. 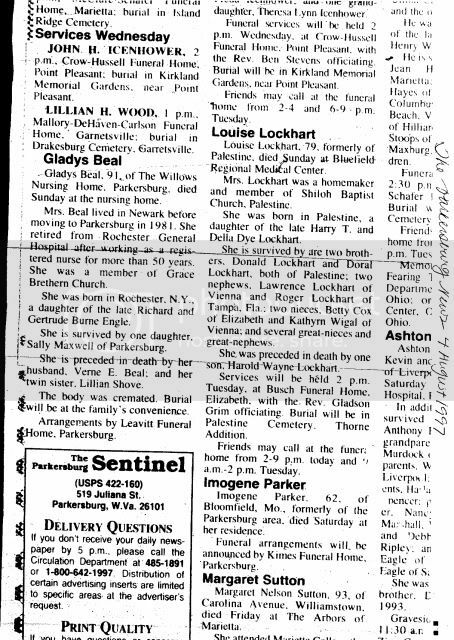 She confirmed her mother's name as it was printed in the obituary of the newspaper from AUG 4, 1997. However, as I had already surmised when our conversation began, this would be a let-down. She informed me that her mother was not the person I was looking for, and that she was not familiar with the actress Gladys Egan. She seemed to be a very pleasant lady and wished me well in my endeavors. Her name was Beal, not Beale, according to both the 1940 census and the Social Security Death Index. According to the 1910 census, there is a Gladys Engle, resident of Monroe, NY, and born about 1906. Also residents of Monroe, NY in the 1910 census are Richard and Gertie Engle. That suggests our Gladys Beal was living in Monroe, NY at a time when Gladys Egan must have been living in the Los Angeles area. Finding out who Gladys Egan's parents were would be a big help in the search. Could Gladys Egan have been a stage name? It appears that the Gladys Egan born in Manhattan on November 24, 1905 died on March 31, 1927 at age 21, in Manhattan. The death certificate number is 8437 and can be ordered from the New York City Department of Records. Note, however, that her place of residence in the 1910 federal census is listed as New York City. Maxster wrote: It appears that the Gladys Egan born in Manhattan on November 24, 1905 died on March 31, 1927 at age 21, in Manhattan. The death certificate number is 8437 and can be ordered from the New York City Department of Records. Regardless of whether or not this Gladys Egan is the silent film star, can we agree that she died in 1927? As for the real Gladys Egan, a film blogger believes that a more likely match was born in Massachussetts in 1900, and last showed in public records in the New York census of 1915. The mysterious Gladys Egan died as Gladys Egan Jacoby in Carlsbad, CA on March 8, 1985. What I really want to know is why did she have to work in movies at such an early age at Biograph? Was her family poor or something? Her father was a letter carrier, and had six children to feed. Gladys Egan appeared in films with Biograph from 1908 to 1912, as well as on stage. She likely earned no more than $5 per day for her work in films, certainly she wasn't the primary breadwinner for two parents and six siblings (as of the 1910 US Census). Her father was a Post Office letter carrier. She had a sister, three years older, who was also an actress. Gladys could not have been born in 1905 -- her earliest Biographs from 1908 clearly show a girl of about 7 or 8, not 3. I have traced her through the US and NY Census, and with the invaluable assistance of a blog commenter, I am fairly certain I've found the Biograph child actor. I spoke with Gladys Egan's daughter, Joyce Henderson, on the phone tonight for a little while. I got a great many questions answered, but I had a few more I wished to ask but she had an interruption from a visitor and asked if I could email the remaining questions to her and she would be glad to answer them. This was especially useful since a couple of them were pretty long-winded. ARE YOUR MOTHER'S BIRTH AND DEATH DATES CORRECT, LISTED AS MAY 24, 1900 – MARCH 8, 1985? She was seeming to recall that March 16 might have been the death date but she wasn't confirming it because she said she was dealing with some health issues of her own during that time. She seemed to feel that, if this was what was listed in the California Death Index, then it was likely correct. DID GLADYS HAVE ONLY THE 2 SISTERS, PEARL M WAGNER AND ELEANORE V KOZAKIS? No, there were a total of 13 children; some died as infants and children, some later, but there were only about 5 surviving by the time Joyce was born. ANY OTHER CHILDREN BESIDES JOYCE? No, she is an only child. HOW DID GLADYS GET INTO THE MOVIES/DISCOVERED? Doesn't know, she wasn’t raised by mother, was raised by a series of nannies over the years and didn’t get to know much about her mother until Mom was already in her 40s, when they began to spend some time together. DID YOUR MOM EVER TALK ABOUT HER CHILDHOOD IN THE MOVIES? No. WHAT DID SHE DO AFTER SHE GOT OUT OF FILMS? JOBS ETC? She went to Secretarial school in New York because her Dad died when she was 17 and so she had to help support the family. Then she met John Jacoby about 1927 or 1928, when she was close to 30. WHERE IS YOUR MOM INTERRED? Telophase Society cremated her, and her ashes were supposed to be strewn about in San Diego Harbor but she thinks they wound up in a creek somewhere, due to a letter she'd received from Telophase Society, accompanied by an apology and $600 for their mistake. I was under the impression from Joyce that this didn't happen only with Gladys' ashes either. The remainder of my questions were placed into an email to Joyce. In addition, I'd asked Joyce if she had any photographs of her mother in adult years that she'd be willing to share with me and she said she'd see what she could come up with and seemed very eager to accommodate me. I'll be glad when I'm able to complete this. Very strange that in all those years she wouldn't have mentioned to her daughter that she was in the movies when they were new. salus wrote: Very strange that in all those years she wouldn't have mentioned to her daughter that she was in the movies when they were new. Joyce apparently KNEW about it, but I'm of the impression that Gladys maybe just didn't feel it noteworthy enough to talk about. As Joyce said, she didn't really even get to know her Mom until later years and she was pretty certain she didn't even have any pictures of her in her childhood. Gladys Egan became interesting to me when I started going to a series of Biograph 8mm programs these past few months. A lot of those early Biographs featured little Gladys Egan and I wondered what ever became of her after Biograph. Apologies if this has been brought up, but the daughter seemed to have had a distant relationship with her mother. Is there any particular reason why she grew up without her mom and only nannies? Also I find it amazing how Gladys Egan's mother had a total of 13 children and only 5 survived. They must have been very poor or maybe it was a harsh world back then without antibiotics. larrys66diner wrote: ARE YOUR MOTHER'S BIRTH AND DEATH DATES CORRECT, LISTED AS MAY 24, 1900 – MARCH 8, 1985? She was seeming to recall that March 16 might have been the death date but she wasn't confirming it because she said she was dealing with some health issues of her own during that time. She seemed to feel that, if this was what was listed in the California Death Index, then it was likely correct. I have a copy of Gladys Jacoby's death certificate: she died at 06:30 on March 8, 1985 in a convalescent hospital in Lemon Grove, CA. Her last residence was a nursing home in Chula Vista. I would love to see that, Maxster. Can you digitize that? It's been a very busy week for me, one of not a lot of rest. However, through a series of emails, I've communicated more with Joyce but I didn't feel the need to post each and every time an email popped into my Inbox, so I waited for an accumulation of them, answering questions. The previous communication had been via telephone and I jotted down the responses as best as I could and posted them above; hereafter, communication has been via email so I am able to simply paste the information here. The following are not only questions I've had, but questions which were raised by others who've helped me in my search, so please bare with me. My father's name was John Edson Jacoby; he was born in Bay City, Michigan, April 12, 1886. His signature read John E. Jacoby. No one ever called him anything but Jack. The story goes that his father Edward Levi Jacoby (of whom he was not fond) named him Edson---Ed's son. Jack resented the fact and wanted his own name, so he legally changed it to John when he was an adult. Jack attended the University of Michigan at Ann Arbor, along with his younger brother Blaine. He studied medicine and later changed to engineering. I know nothing of any further education. Gladys and Jack met in New York city in the building they worked in. She was a stenographer; I don't know what he was doing. They married in New York sometime around 1927-8, as she told me they were married 8 years before I was born. I don't know why they came to California in the 30s. Perhaps he found work or tried to.. It was during the depression. She did relate stories about road building around Bakersfield and lack of money. Unable to come up with return fare, Gladys wrote to the mayor of New York city asking for help. He sent them a ticket home! That's probably true, she was quite adept at solving sticky problems. My mother never spoke to me about Griffith except to say she worked for him. I don't know why she gave up acting. I had the feeling that after her father died my grandmother needed a better, steady income, so she sent the girls to secretarial school. But her father died in 1917, and I don't know when she quit acting. It may have been before that. I have no impression of Griffith, she didn't talk about him. I know she was acquainted with Pickford and she did mention the Gish sisters, but without detail. She did seem fond of Marie Dressler. I have no favorite film; I have never seen one. Gladys did not share stories about Griffith or other actors other than to say she was fond of Marie Dressler. I don't know when or why Gladys quit acting. This is the first I've heard of any stage acting. Gladys was born May 24, 1900 in New York City to Margaret Sheeran Egan and Thomas Francis Egan. My husband Larry and I have four children. Jack Jacoby was born Edson, or Eddie Jacoby in Bay City, Michigan in 1886. He changed his name because he resented being called "Ed's son". His father, Edward Levi Jacoby, was a railroad engineer, and Jack didn't like him, so I didn't spend time with him. There was a picture of the three of us when I was about 2 or 3, so I obviously saw him at least once. Jack's mother was an adopted child, Ellen Masury, and the mother of Edward's five children: Edson, George, Thurlow, Alice, and Blaine. Jack said his mother was crazy and his father had her put away. Jack and Blaine attended the University of Michigan at Ann Arbor; Blaine died in a boating accident near campus while Jack was out of town. Jack studied medicine then changed to engineering. Somewhere along the way before I was born he did a stint in the army (something about the Mexican border), picked up gardening and tailoring skills (he taught me to sew), and married my mother. When I was born Jack was an automotive engineer for General Motors in Detroit. When the auto industry geared up for wartime efforts, he worked for the government in the aircraft industry, which took us between New York (family), Detroit (GM), Los Angeles (Douglas), and Seattle (Boeing) for good part of my childhood. Jack died of cancer in New York City on August 3, 1948. After that my mother and I moved to Los Angeles.